Epic Journey, 2010, Single channel HD video with stereo sound, 11 hours. 30 min. 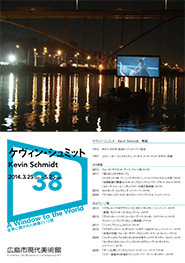 Kevin Schmidt staged a performance in which a small boat floated down a river carrying a large screen showing the entirety of director Peter Jackson’s Lord of the Rings movie trilogy, over 11 hours in length, from dusk to dawn of the following day. The viewer simultaneously witnesses the epic journey of the heroes in J.R.R. Tolkein’s fantasy realm and the long and arduous journey of the vessel through a genuine natural environment, which is “epic” for a boat of its size. The boat’s endeavor, while ridiculous, is actually performed in the real world, while the quests and battles of the film’s elves and wizards are sublime and destiny-shaping, but are after all nothing but fiction. Schmidt highlights the similarities and contrasts between these two epic journeys in this humorous and thought-provoking work. Born in 1972 in Ottawa, Canada and lives and works in Vancouver, Schmidt graduated from the Emily Carr Institute of Art and Design in 1997. He was in the artist-in-residence at the Ted Harrison Artist Retreat, Whitehorse, Yukon (2008) and the Fogo Island Residency Program, Newfoundland (2011). He has participated in many exhibitions including at the Montreal Museum of Contemporary Art (2011) and the Montreal Biennale (2013). In 2008, he received the VIVA Award, the Jack & Doris Shadbolt Foundation for the Visual Arts.